You come across them more and more in new housing districts: high-voltage parks. These remarkable, elongated strips of parkland, with high-voltage masts as their central features, often slice right through neighbourhoods. Leiden, Almere, Rotterdam and Dordrecht already boast such strips of land, while another fifty are planned around the country over the coming years. But how pleasant is it in a park beneath ominously crackling wires? Two causes can be pointed to for the emergence of high-voltage parks. The most important reason is that cities are expanding beyond the high-voltage routes that were originally planned in countryside areas. Since the 1960s these routes have carved big lines through the landscape transformed by land consolidation. On the fringes of cities the overhead power lines are converted to low-voltage and carried underground to power points. In functional terms, high-voltage lines are more important than motorways: the entire Randstad is currently supplied with power by one ring system. The embracing of this large-scale infrastructure by neighbourhoods produces interesting encounters. The kilowatt hours race through this electricity superhighway while below are playgrounds and dog parks. The second cause for the emergence of these parks are the guidelines issued in 2005 by the State Secretary Van Geel. He advised against building homes in zones where the electromagnetic radiation exceeds 0,4 microTesla. This translates on the ground into a strip 180 metres wide that must remain free of development. The motive for these guidelines is a study that reveals that more children suffer from leukaemia near high-voltage masts. It is unclear whether magnetic radiation is the cause of the increased chance of this illness, but the authorities are keen to prevent a repeat of the Softenon scandal. 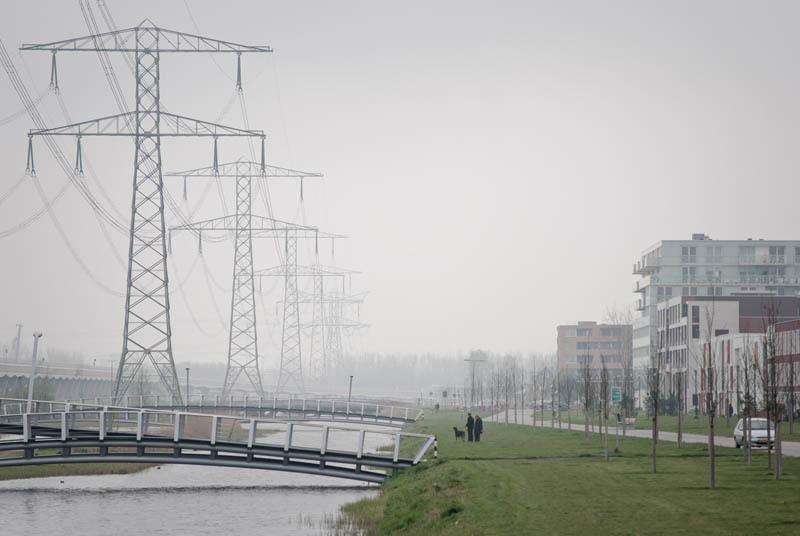 If the New Map of the Netherlands is laid over the high-voltage network, we see some fifty new high-voltage parks around the country. The park zones, obligatory for developers, can be a blessing for future residents. After all, without high-voltage power lines, such zones would no doubt be fully developed. And who is going to say no to a park? At the same time, high-voltage lines have a bad reputation. Rumours about radiation that causes illnesses, the cracking of lines in wet weather, and the tremendous size of the masts mean that many people would rather not have a thing like that in their neighbourhood. Residents have successfully torpedoed the erection of new overhead 380kV cables to the south of Delft. A logical response to the problem of high-voltage lines is: why not bury them underground? 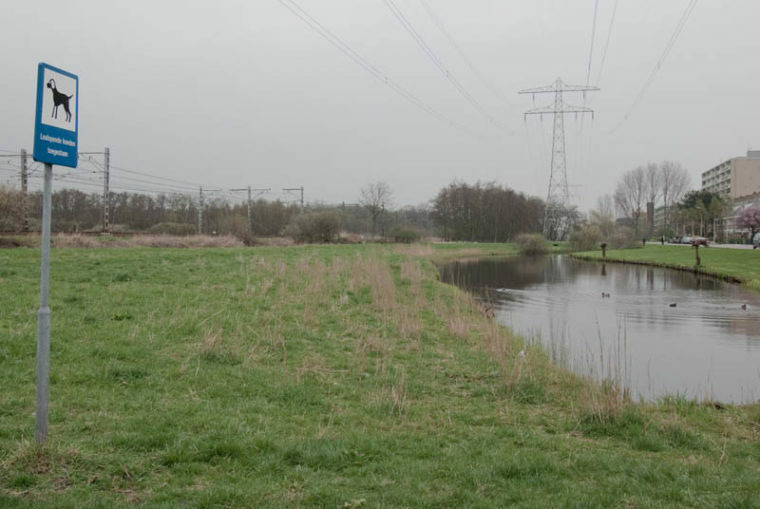 In early March there were reports of how high-voltage lines will chop a residential district in Brandevoort (Helmond) definitively in two. Despite two-and-a-half years of resistance and initiatives by surrounding residents, they did not succeed in getting the high-voltage lines buried underground. Although its technically possible to hide cables underground, cost is a limiting factor. Tennet calculates that every underground metre costs 10,000 more than above ground. On top of that, the zone above ground must remain accessible to facilitate work on the cables. Even a park design is therefore impossible. Moreover, the masts and cables may be hidden from view, but the electromagnetic radiation is still there, albeit in a narrower strip. As a matter of fact, the Brandvoort case sets a precedent. By far the majority of the fifty new high-voltage lines in built-up areas will be erected overhead. The possibilities for a typical park layout beneath high-voltage lines are limited. Safety regulations mean that greenery around masts and beneath cables is often prohibited. Fishing and kiting are also prohibited, and you play football at your own risk. Radiation can charge steel, and that means that pacemakers could be reset. And no matter what you design, the huge masts will dominate the scene. Because of the limitations, the current layout of high-voltage parks has a character somewhere between undeveloped leftover space and a cheap imitation of a city park. So we have a new design challenge that has to take many limitations and into account. One surely hopes, specific conditions and limitations notwithstanding, that a new type of park can emerge that expresses the development of green energy or integrates high-voltage masts in a striking manner. From that point of view the fifty future high-voltage marks can learn from their forerunners. 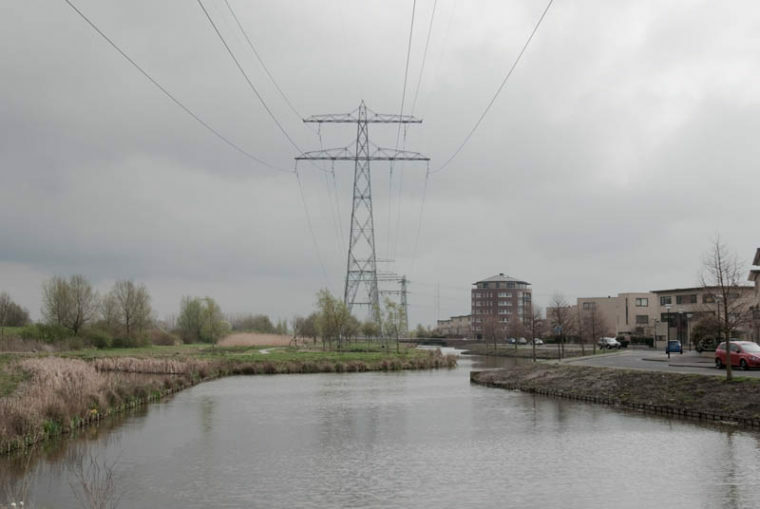 The Weerwater in Almere is a splendid example where high-voltage lines carry across the lake and into the heart of the city. The size and scale of the area are in keeping with those of the cables and the masts. The park in the Nesselande neighbourhood in Rotterdam is a more recent example of how different it can be. The 380kV cables run above ground for a distance of two kilometres straight through the neighbourhood. The space below is laid out with water features, islands and reeds. Custom-made bridges give this park plenty of style. The buildings on both sides shape the space in between. The high-voltage line itself runs parallel to the metro line. Nesselande demonstrates that a high-voltage park can be a full-fledged park. These are nice examples, but they rely on traditional elements such as water, greenery, and bridges. Many innovative possibilities for design and use still remain unexplored, however. The high-voltage masts themselves, for example, can be planted. As extra large climbing frames they offer the perfect habitat for climbers like Virginia Creeper. That would enable the masts to change colour with the seasons, from fresh green in spring to scarlet in the autumn. Another possibility is park lighting powered by the electromagnetism from the masts. And what about Wi-Fi hotspots in the high-voltage masts: free Internet for everyone in the park. Nonetheless, in practice it is almost impossible to alleviate the suffering of the high-voltage lines and radically improve the quality of the space below them. Simple proposals such as planting, lighting and Wi-Fi are immediately met with resistance and suspicion from Tennet and are therefore blocked by regulations. In the end, the real problem lies in the supposed health dangers of high voltage power itself and the accompanying safety regulations. And as long as heath concerns have not been addressed and the regulations amended, most high-voltage parks will remain nothing but green out of necessity.